Posted 6/29/2018 3:36pm by Melanie & Kevin Cunningham. 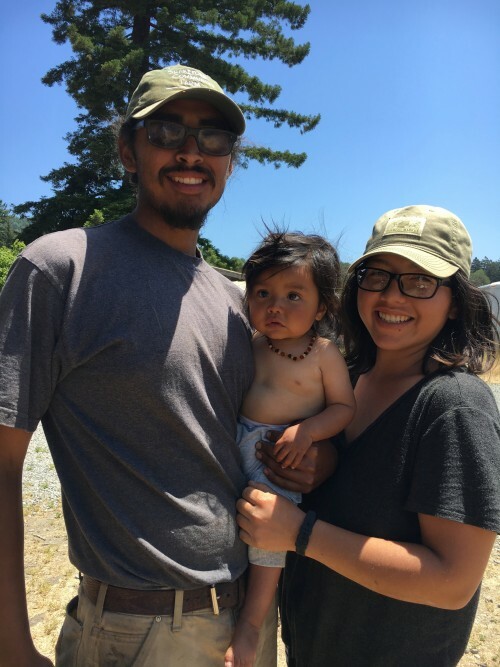 Meet your farmers: Jackie, Daniel and baby Elias... Daniel was accepted as a Shakefork apprentice in 2016. His roots are in the urban landscape of Anaheim, Orange County, and he came to us with no prior farming experience. With a great reference and a successful in-person, working interview, we decided to take a chance. My oh my, are we glad we did! His partner, Jackie, joined our team 2 months later and quickly becoming an essential part of the farm crew. In 2017 they came back for a 2nd season, this time growing a little baby. 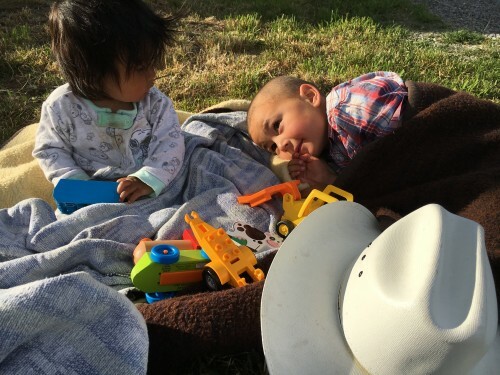 After Elias was born in September of 2017, Jackie and Daniel opted to stay through the winter, wanting to experience a Humboldt winter for themselves. This is their 3rd season at Shakefork!! I asked Jackie what she loves most about farming, and she gave the answer I expected: "The work!" Both Jackie and Daniel value the hard work of farming that always comes with visible results at the end of a day. They also really enjoy providing food for the community and the appreciation from our CSA members and market customers. Daniel says, "You never go hungry, and the seasonality keeps it fun in the kitchen. Feeding friends and family - I like that!" 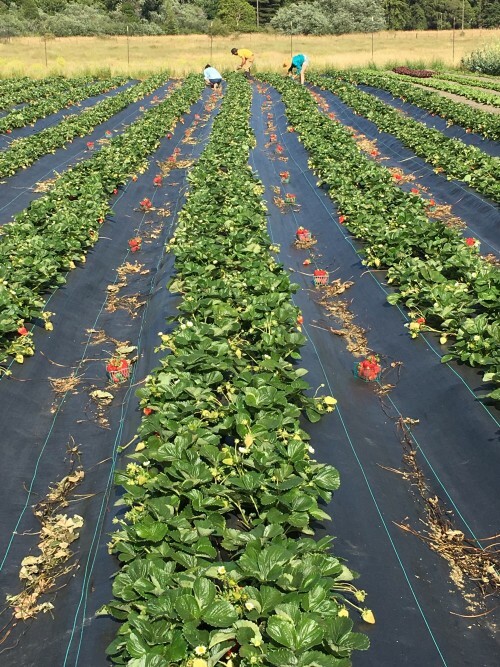 Strawberry abundance... Last week we picked 330 baskets; This week, 550! Incredible, I know... we can barely believe it ourselves! When we have surplus beyond the CSA and what we can sell at market, we'd like to offer all of you a stellar deal on bulk berries. Buy a flat (15 baskets) for $55, 25% of our market price. Freeze 'em, jam 'em, pie 'em or just eat 'em. Let us know if you're interested, and we'll put you on a "to-call" list. 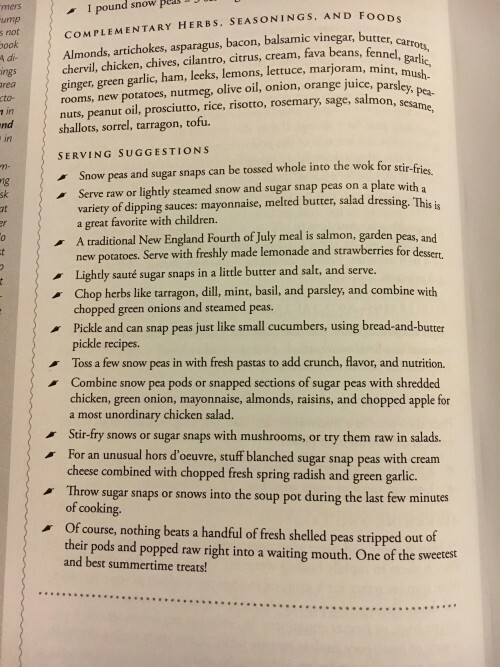 More about peas... We've been saving our snow pea seed for a decade, since our farm's inception in 2008. We purchased the original biodynamic seed through Turtle Tree and have been stewarding it ever since. The season is abundant, but brief, and our plantings are definitely on their way out. Our first peas were sown in the greenhouse in at the end of January and planted out in early March, with successions to follow every few weeks through April 1st. We had beds prepped early and tarped. As starts became ready, we rolled the tarp back and planted, then installed trellis. The forethought and winter work really paid off! Snap peas and pesticides... Did you know that conventionally grown, imported snap peas are on the "Dirty Dozen" list? This means they are very high in pesticide and herbicide residues. This residue is particularly harmful to children, as well as to adults with health issues. Just another reason to savor our organically grown, very local, just picked snap and snow peas. They're coming... In Carlotta, tomatoes have to be planted in a high tunnel to really thrive. We planted ours out in April, and they are loaded with fruits galore. We spend about 16 hours a week trellising and pruning. So much work, but worth it (we hope). 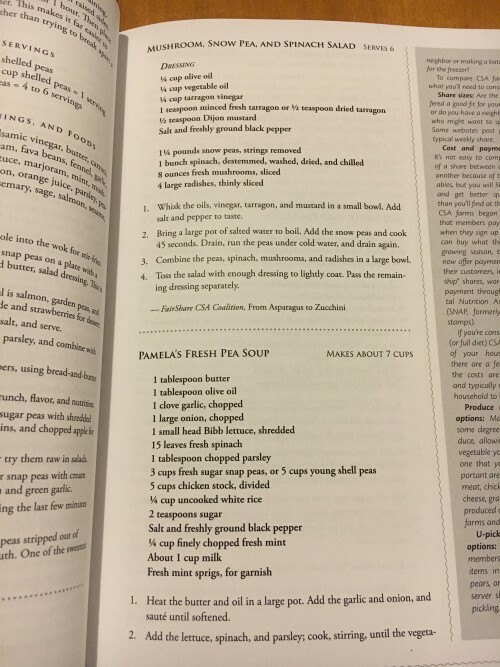 CSA week 4: pick up TODAY! Posted 7/11/2017 9:23am by Melanie & Kevin Cunningham. The heat & sunshine of high summer have been elusive at our Carlotta farm this summer. We are 16 miles from the coast as the crow flies, and we're really feeling the maritime influence this season. Our diversity makes us more resilient to the whims and vagaries of mother nature, as whatever the weather holds in store for us this season, it's bound to be good for something that we grow! New in your CSA boxes this week are a farm favorite, the heirloom cucumber 'Boothby Blonde'. This cucumber obviously shares genetics with the old-fashioned lemon, and the seed was reputedly stewarded for 5 generations by the Boothby family in Maine. Occasionally some of the first cukes will present a little bitterness, but it's all in the skin and easily remedied by peeling. Strawberries and scallions continue to grace your boxes. Geri & Earl, my mother and father-in-law, who have been land partners since the beginning and a full-time presence on the farm for two years now, made an incredible strawberry salsa last week using the strawberries and scallions in their garden share. CSA shares have been known to inspire creativity in members, so don't be afraid to "think outside the box" and have fun with your weekly offerings. Hilling potatoes on the 4th of July, it doesn't get more American than that! Here's apprentice Anna Dozer working the All-in-One behind the oxen. Displays of fun and interesting information about each farm. Farm-fresh food demo with Double D Steak House's talented chef, Jeff Dunker, beginning at 3:30p. The Fresh & Festive Community Events were imagined this winter by the Fortuna market farmers and developed in partnership with many local businesses and organizations. There will be special events every Tuesday at the market starting today and for the next 7 weeks. Fortuna Farmers' Market will even stay open an additional 1/2 hour, from 3-6:30p. If you don't pick up your share here, make sure to stop by sometime! What's coming up? Carrots are sizing up, and broccoli is not far behind. Then beans... green, yellow, and purple! May you all relish the growing abundance of summer and the incredible variety and flavor that good soil, long days and sunshine, and many hands working together make possible. Melanie, Kevin, Clyde and the Shakefork crew: Jackie, Daniel, Matt, & Anna! Posted 4/18/2017 11:51am by Melanie & Kevin Cunningham. Over half full and filling fast... How wonderful to be writing this with bright, warm sun beaming through my office windows! With spring in the air, we've been receiving CSA commitment forms at a furious pace. If you are serious about a CSA share for the season ahead, we encourage you to act now! Still soggy… This extra wet spring - or long lingering winter - just doesn't want to quit, and it's certainly been the wettest, coolest spring we've ever experienced as farmers. We've had to put our carefully laid plans aside and tackle other farm projects as the weather permits. Our propagation greenhouse has never been fuller, and we are fastidiously watching the weather, ready to jump on garden work when the conditions are right. Although the rain is wonderful in many ways and a blessing to be sure, a lot of us local farmers are feeling a little anxious about our spring planting dates. The Saturday Arcata market, which goes year round now, is very light on veggies and probably will remain so later into this season. As for the start of the CSA, for the last 7 years, we’ve always been able to start the first week of June, but this year may be different. It's still too early to call, but know that we guarantee 22 weeks of produce, even if that takes us into November. The abundance of summer will be ever more delicious given the long winter, and we look forward to growing food for you and your families again this season. Bring on the high tunnels! This winter, Melanie applied for a federally funded grant through our local Natural Resources Conservation District (NRCS) and was awarded over $20,000 for two, 30’ x 96’ high tunnels. These investments will be a game changer, enabling us to triple our winter production and reliably plant earlier in the spring. We have a three year contract, but will strive to construct both by the end of 2017. 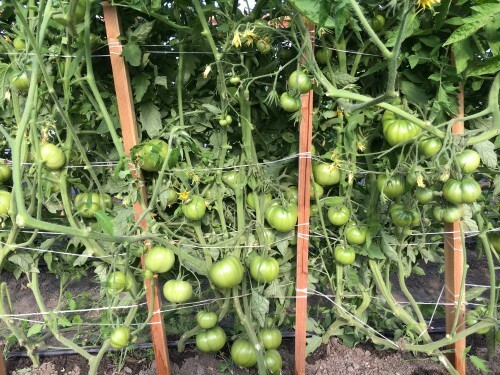 We plan on using the high tunnel space to grow more summer tomatoes for our CSA members as well. Unfortunately the high demands of the cannabis industry have our supplier quite backlogged, so we aren’t able to get ours until mid-June. We do look forward to the potential and increased value these investments offer the community and our CSA members. And if we have another record-breaking wet winter ahead of us, we will be well poised and ready. The oxen went viral... We've all heard of things going "viral" on social media. Well, on April 4th we got to experience it with one of our posts, and I have to say, it's exciting!! Our apprentice, Daniel, filmed our twice weekly layer move, where we use the oxen to pull our chicken coop on skids. This super cool video has reached over 30,000 people and been shared 134 times!! If you missed it, it's worth skimming through our Facebook posts for this gem, shared on April 4th. Raw oxen power fully demonstrated on our mixed power farm! New crew… Our apprentices have arrived and successfully completed their first two weeks of an 8 month season. This year's crew hails from all parts of California. Jackie and Daniel, pictured below on the right, are returning from last season, and you may remember meeting them at Garberville and Fortuna markets. Matt and Sage, pictured on the left, are new this year and learning quickly. Spencer, our first oxen apprentice, was with us over the winter but has returned back to Massachusetts to start his own project there. We are lucky to have these fine, enthusiastic future farmers in our midsts. Baby animals… The spring brought 20 new lambs and 9 new calves to the farm. The abundant rain has been really wonderful for our pastures, and our livestock are flourishing on the green and the grubs. We started a new layer flock over the winter, and our 300 hens are just starting to lay. Their eggs boast a rich, golden yolk full of healthy omega-3's, due to their diet of grass, grubs and bugs. Our first rounds of broilers and pigs are fattening up quickly on the combo of organic feed, skim milk, and pasture grubbin’. Whether you plan on re-joining the share or not, we hope you stay in touch. You can do that by going to our website - http://shakeforkcommunityfarm.com/ - and signing up for our general mailing list, or by following our farm on Facebook. 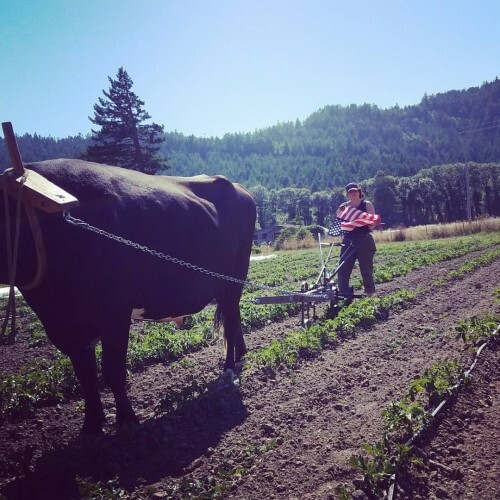 Kevin and I both have Instagram feeds - @shakeforkcommunityfarm is mine, and @westcoastoxen is his - for more insight into the day to day of life, love, and work at Shakefork Community Farm. Farmer Clyde's play is undaunted by the stormy weather. Spring has sprung... now bring on the sunshine! Posted 3/23/2017 12:27pm by Melanie & Kevin Cunningham. It is finally feeling Springy on the farm, and with sun in the extended forecast, we are hopeful indeed. We have ground opened up, farmer talk for a start on the fieldwork that makes it possible start planting in the weeks ahead. We have some gorgeous brassica starts slated for planting out the first week of April; fingers crossed, all things will align to make it so! You all know how exceptionally wet this winter has been – the wettest on record, in fact. It started raining in October and hasn't really stopped. We were lucky to get our strawberries and garlic in last October, in the three days it didn’t rain that month. Some of our farmer friends did not fare as well. Cummings Creek is up and raging, and we experienced a little flooding in our garden fields earlier this week. Most of the flood water is being captured by a drainage ditch we built last fall, and we have plans to do more work once the ground is dry enough to get equipment in. Now we’re just hoping for a stretch of sunny days, so we can get compost spread, beds prepped, and crops in! We stay busy over the winter months, caring for the many animals that make up the Shakefork farm-ily. If you follow us on Facebook or Instagram – which we definitely recommend that you do! – you’ve seen lots of pictures of lambs, calves, cattle, and oxen. Perhaps you’ve wondered, what does all that effort have to do with growing good vegetables? The collective accumulation of ox and dairy cow poo in the barn over the winter months, as well as the bedding accumulated in our chick brooders, is piled and composted, providing the annual fertility for our vegetable garden. Through a combination of cover cropping, crop rotation, and ample compost, we’ve been able to produce more food on less acreage every year we’ve farmed. 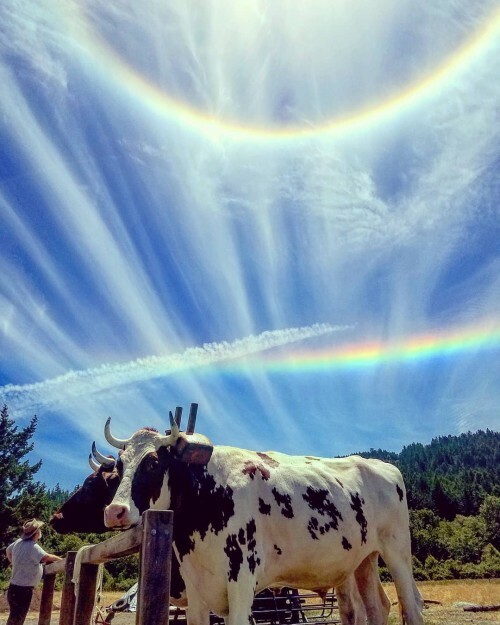 We also benefit from the healthy meats, milk, and fats our primarily grass-fed animals provide us, as well as the tremendous value of being in relationship with other living beings. They teach us so much! We attended a Food Safety workshop this month, hosted by the Community Alliance for Family Farmers at Deep Seeded Community Farm in Arcata. We affirmed many of the good agricultural practices we already have in place and gained new ideas for improving our systems. Farming is certainly the “Dirty Life”, complete with muck, mud, and manure, but we strive for a very clean operation in all areas and take cleanliness and sanitation very seriously in all aspects of our production. We’ve added an additional CSA drop site in Old Town, Eureka! 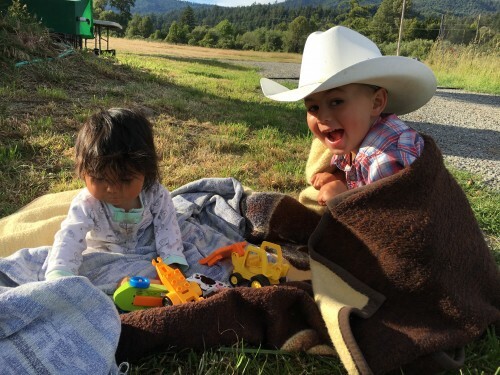 The owners of Humboldt Bay Coffee Roasters have been shareholders since the inception of our CSA and have offered to host a pick up spot at their Old Town Eureka location. Boxes will be available from 3p till close, and then all day Wednesday. Please help us spread the word! Our St. Joseph Hospital drop will have extended hours, 11a-7:30p every Friday. Keep those CSA member agreement forms rolling in! Distributions will start in early June and go for 22 weeks. We offer two share sizes, 6 pick up locations, payment plans, and accept cash, checks, and credit cards! We’re close to half full; help us get there by sending in yours today. Print your form here. Get CSA info here. Posted 5/5/2014 1:03am by Melanie & Kevin Cunningham. Greetings from the midst of May Mania! We love this time of year. The days are long and bright, affording us plenty of time for planting - onions, potatoes, winter squash, lettuce, broccoli, and more! - and other important early season work. The grass is lush and green, which means the cattle and sheep are well fed. We have 2nd and 3rd graders from Hydesville and South Fortuna Elementary Schools visiting to participate in farm life for a couple of hours. And soon, our plates will be brimming with the first rewards of our labor - spinach and arugula salads, juicy sugar snap and snow peas, spring sweet onions, over wintered leeks, and eggs with yolks a deep earthy gold. Life is good! Our first vegetable CSA distributions will be begin the first week of June, just a few short weeks from now. 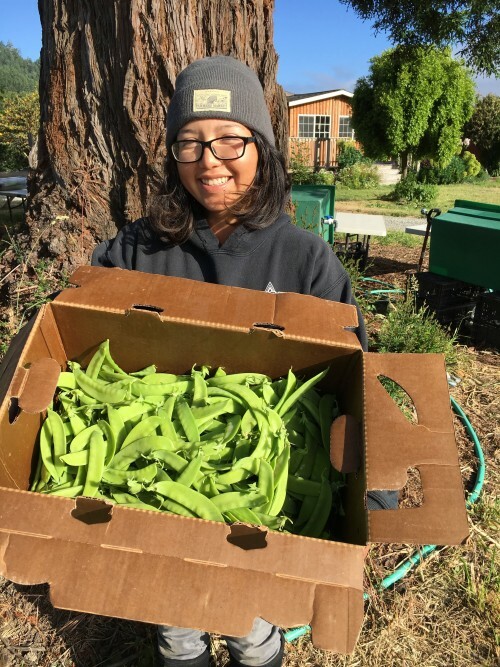 In addition to on-farm pickups, shareholders can pick up pre-packed boxes of organically-grown goodness from Fortuna on Tuesdays and Garberville on Fridays. Shareholders have access to garden surplus for canning and preserving projects and get first dibs on other farm products like our pasture-raised eggs, chicken, and turkeys. Is a regular share too much produce for your small or busy family? Try our half-sized garden share. It's not too late to reserve your spot by sending in a commitment form. Want to see our farm in person? Please come visit on Sunday May 18th, from 2-4p for a farm tour and meet your farmers event. We're excited to show you the garden and animals and share with you some of what makes us unique as a farm. We'll introduce you to our oxen team, Tex and Joseph, and show you how they respond to voice commands. It's a family friendly event, and you are welcome to bring anyone interested in possibly joining our CSA or just checking out a local farm. All are welcome, especially the little ones. Farm treats will be provided. We hope to see many of you here on the 18th. To find the farm, travel east on Highway 36 about 7.5 miles from the 101. We are the driveway on the right, just before the new Carlotta fire station. You will see our mailbox marked 7914, as well as a yellow traffic sign with a black fire engine on it about 100 feet before the driveway. Once on the driveway, stay left, cross over Cummings Creek, and look for parking on your right. Our ecology and our food systems are simply a visible manifestation of all the value systems, or thought processes, of every individual in the culture. One person, or one organization, or one group cannot fundamentally change things. It's the collective understanding of many that moves things from peripheral lunacy to cultural shift. CORN HARVEST PARTY - happening tomorrow! Posted 10/12/2012 10:03am by Melanie & Kevin Cunningham. Although the weather has turned a little moist down here in the mid-county, we're still ON for our corn shucking party tomorrow, October 13th, from 10a-4p. Come all day, or just for a few hours... dress in layers and bring gloves if you have them... please provide your own snacks to keep you nourished through the day... bring your kids, your neighbors, and your friends!!! We will feast around 4p! We're making some farm favorites, including chili, cornbread (with our own cornmeal! ), coleslaw, and potato salad, but potluck dishes are appreciated. We've opted not to BBQ in favor of building a big, warming fire instead. Live music will fill the air, weather permitting. Our pumpkin patch also opens Saturday, so feel free to shop for a Jack O'Lantern while you are here! We hope to see you! Directions to our farm can be found on our website, here: http://shakeforkcommunityfarm.com/map/directions/119, or look for the pumpkin patch sign on Hwy 36, just before the fire station.